Read on, fellow voyager, fellow reader, read on in "the bright book of life," past the fantasy trilogy of AMERICAN ECSTASY. 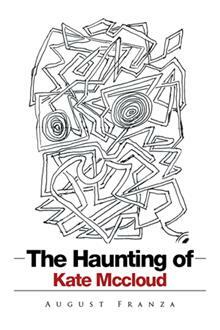 Salman Rushdie reminds us that "The novel tells us things about ourselves that we hear from no other quarter." That's a mouthful to swallow in the age of the Internet, but I believe it's true. Every day, day in day out, there is human drama all around us and in us. It contains struggle, success, failure, irony, paradox, and contradiction. Andrew Pilger and Adrianna Romano, having lived together for two years, decide to take a vacation on Montauk Point, Long Island. The want to know where their lives are going and what will be their next step as a couple. They never get the opportunity because once they are settled at The Sunset Inn, Andrew goes for a walk and doesn't return. The novel then follows Andrew on the beach and Adrianna at the Inn as she awaits his return. Has Andrew consciously decided to escape or has he let events take their course? When Roy and Julia Turner retire to an upscale 55-and-over condo complex at Vista Bay, Roy finds himself swept up in local politics and inter-generational conflict while his wife finds new business beyond the complex and a boyfriend. As Roy focuses on the gulf between the few rich and the many poor, and on the conflicts between age and youth, Julia finds much more personal matters to attend to. Their new goals and aspirations split them apart. Joseph Kaye's life is a muddle and it's his father's fault. Jacob Kaye has made an important decision for his son that alters Joseph's life and his way of thinking. In this American historical fiction, it is 1950 and the Korean War has just begun. To save his son from being drafted, he convinces him to sign up with ROTC at college to insure a deferment. This decision goes against everything Joseph Kaye believes and wants. Deeply disappointed and demoralized, Joseph nevertheless earns a commission and goes on active duty after graduation. How he deals with this burden, whom he meets, and the new experiences he has lead him to rethink the meaning of his whole life. 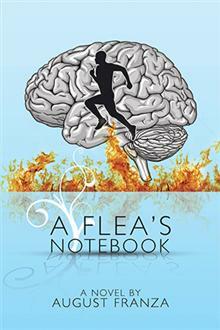 Stiven Dedall, a rootless and isolated man, finds a mis-sent letter in his mailbox and opens it by mistake. The content of the letter surprises him, begins to interest him, and then gives a focus to his aimlessness. Encountering two very different women, Ariana Rogers and Joyce Munn, he sees a way to change his direction and his life. Brenner, a scandalous poet, is forced into exile by a ruthless regime. He's got to endure a life of isolation which is completely opposed to his active and prominent life as a popular and controversial poet in a renowned city. 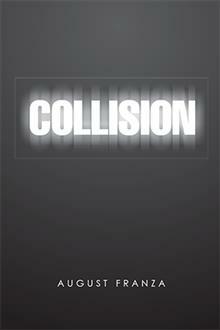 While Brenner is wrenched from society into bitter and extreme exile, Stiven Dedall finds intense and dramatic social contact and intellectual interaction. What choices will they make in these new and radical circumstances? In Prague in 1912, two years before the outbreak of World War One, Franz Kafka, a Jew, undergoes extreme duress as he plans the murder of young artist Adolf Hitler, a man who suddenly invades Kafka's life. A dream has told Franz that his three sisters are in mortal danger from this street artist from Vienna. 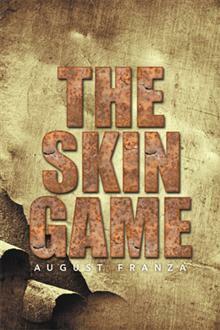 The question that plagues Franz is where in this young street artist is the evil man who will endanger his sisters? Until he has substantial evidence, he cannot act. He decides to engage, observe and get to know the young man who, as a result of his experiences in the coming war, will emerge as the powerful and murderous leader. As Frankie Croce tries to get out from under his father's violent behavior, he turns in desperation to drugs, petty crime, deceit and betrayal. He has spent his life in the Croce family fearful, dependent, and desperate. 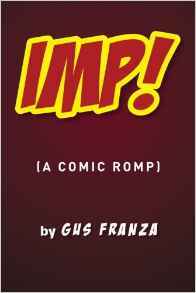 He tries to fight his father's control and violence, but he is impotent. As he comes to realize, after many attempts at flight, that there is no escape, he resorts to the only solution that will finally and forever rid him of his overwhelming burdens: the murder of his entire family. Here the author departs into darker more ambiguous realms and positions. The people in these short stories are troubled, mixed up, sometimes rudderless, and generally don't know the way out. Therefore, a condition of stasis exists. Leo Morgan, an isolated writer, is found dead by his alienated son James and daughter Sylvia. His apartment has been ransacked by an intruder and his hundreds of books have been strewn about. 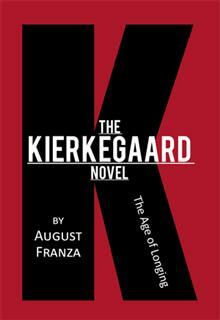 A manuscript he has been writing about Soren Kierkegaard has been torn to pieces. James spends many anxious weeks trying to make sense of the ruined manuscript as he tries to salvage it and mend his relationship with his distant father. As the murder case is investigated by the police, Detective L.V. Quine is drawn into the lives of the disturbed Morgan family. THE NAVIGATORS is about the hardships and disappointments the Del Vecchio family encounter when they immigrate from Italy to New York City at the beginning of the 20th century. They encounter harsh conditions which they are not ready for. In PULLING A GAUGUIN, Caril Bridgewater abandons her husband and family to pursue her dream of becoming a painter. With Paul Gauguin as her model, she slips away, leaving no information about her destination. When her husband Ben goes in pursuit of her, many conflicts and complications ensue. Caril accomplishes her goal, but pays a heavy price. BIRDS OF A FEATHER is about a violent student revolt in an isolated high school during a severe blizzard. This turbulent event cuts off students and teachers from their normal lives and routines. Smoldering conflicts then erupt between students and teachers which lead to the student revolt. CONDOMANIA, about snow birds on vacation in Florida, begins in a comic mode. But that atmosphere slowly deteriorates when pettiness, superficiality, and vicious infighting emerge. These events are mild compared to sweet, 93-year-old Dolly Flynn's slide into vengeance and retribution. Luke Hall is an unhappy, dissatisfied man. How is he supposed to manage his discontent with his wife, the world, his job and colleagues, particularly, Dante Obini, his alter ego? He desperately wants to escape from Eagle Insurance of Long Island and his suburban misery. Taking a clue from ancient myths, he transforms himself into an eagle, a majestic Haliaeetus Leucocephalus. As a bald eagle, he flies free of the chains that bind him. Ah, but there's a catch. Luke Eagle's existence is endangered by environmental pollution which has poisoned his brain so that he is trapped by hallucinations. He enters American history, but whose version is it? As the surprised reader laughs at his predicaments, Luke searches as man and eagle. 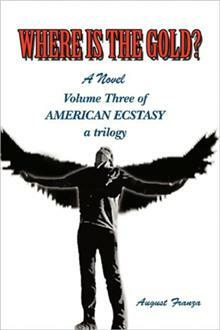 He seeks an authentic life, a life of his own, but how can he find it when bizarre events trap him? 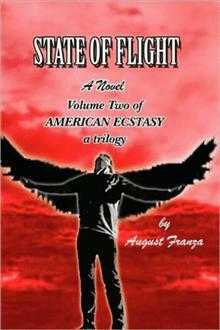 State of Flight continues the dramatic and bizarre experiences of Luke Hall, suburban bourgeois man and soaring eagle as he buffets through a lost job, a divorce, and a new doctor, David Golyeth. He also embarks on crazier and more twisted adventures in hysterical history. These involve Aaron Burr, Andrew Jackson and, Abraham Lincoln, among other historical figures . In his human form, Luke struggles to make sense of men, women, and his own personal conflicts. State of Flight ends with blunders and the death of the author. But fear not, readers, Volume Three will be written by a new writer named Raguan Z. Faust and Luke's human and eagle adventures will be even more profound and significant. 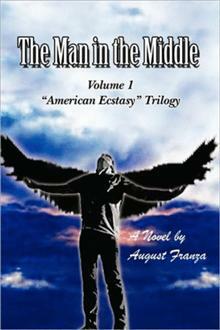 ​In the final volume of AMERICAN ECSTASY, written by Raguan Z. Faust (aka August Franza), Luke Hall, the man/eagle, baptizes himself for new and possibly more hopeful roles. He conjures Rachel Landauer, an old girlfriend, and flies west with her to experience a series of encounters with America, past and present. These include chemical and environmental pollution, industrial strikes, transcontinental railroad building and many scenes of mental derangement. He also meets Col. George A. Custer, P.T. Barnum, Leon Trotsky, Whittaker Chambers, and Alger Hiss in the strangest of circumstances. After many bizarre adventures, Luke ends up teaching at a suspect College of the 21st Century. Around and around he goes in conflict with all manner of men and women, until he meets Zamattia Ueberruaga, a Basque-American woman of many delights. Luke is finally grounded. He gives up his eagle life and all of its derangements to settle down with a woman he loves and who loves him. 18 year old Mark Gamble is searching for his long lost mother. Eager to reunite with her, he discovers where she is living, then journeys across the country from New York to Washington State during a politically dangerous time. On his way, he encounters two young women, their families, and a mystery man. What Mark finds at the end of his journey is unexpected and shocking. A giant American fast food company convinces the author, Miguel Cervantes, to permit Don Quijote and Sancho Panza to advertise burgers in South America. After the famous duo are educated in the realities of the modern world, they set about their tasks only to find every plan of Naches Fast Foods backfires in one comic episode after another. 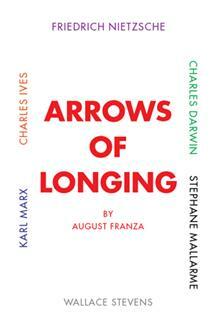 Five plays and filmscripts about Charles Darwin, Karl Marx, Stephane Mallarme', Friedrich Nietzsche, and Charles Ives. Joseph James Katharin, known as "Handsome" and "JJ", is a young man uncertain of his identity. Naïve about the world, he is parentless, raised by a stern grandfather who thinks the worst of his grandson although he tries to love him. As problems load up on JJ, he seeks solace and equilibrium where he can but questions assault him: Is nobody innocent? Is nobody dependable? Is nobody trustworthy? Is love just a dream? Is it all a game? Jerry Floh ('flea' in German) is invited to a Southampton mansion for a weekend by movie producer Buzzy Powers. Jerry grew up with Buzzy, formerly Buzzy Pulsky and now twenty-five years later they have met by chance. Jerry is surprised at the invitation since he has a bad memory of Buzzy who has risen to success while Jerry grinds it out as a suburban teacher with a wife, Flo, and three kids. His stay at the mansion, which lasts far longer than a weekend, turns Jerry's world upsidedown and from which he barely escapes. A love story about Alzheimer's. 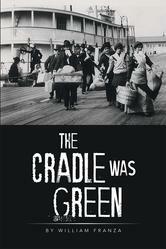 Through misery, tragedy, struggle, and unyielding hope, the Bernardi family, Italian immigrants in New York City at the beginning of the 20th century, inch their way upward with grit, determination and love. On a vacation in the Caribbean, Sam Gumbs lives an alternative life in LIZARD ON A WHITE WALL. Mark Nido, a strange employee, is protected by the supervisor of a company for reasons considered suspicious in THAT MAN. In THE LIFE I HAD IN MIND, kinds of love are revealed in the lives of two friends. THE VITAL CENTER is a satire about committed, horny, abrasive, and flawed teachers and students in an American high school. 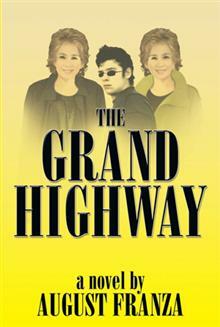 Wally Androsch, helluva nice guy, has a serious problem he and Mimi, his beloved wife, want very much to solve. The solutions are funny and bawdy. Kate McCloud is a lost woman who wants to know if there is a difference between being alive and being dead. Other characters in this polyphonic novel are in the same condition because they are haunted by irresolution and a lack of love. The novel takes place in tropical Bibilona, Henry's Bar, Washington DC, and a Manhattan hotel where a lost play is trying to be reconstructed. 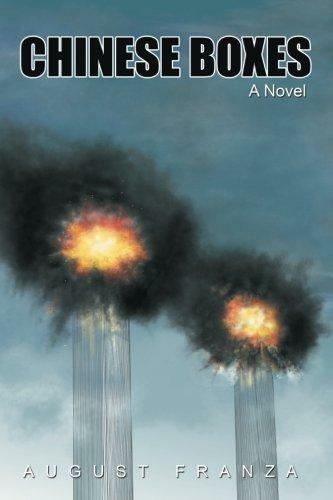 Chinese Boxes explores the dangers and depths of love and 9-11. The Thirst We Have is about a day in the life of an embattled teacher. From dawn to bed time, Joe Monte dallies with his students, his colleagues, his wife, and his children. Bob, Son of Battle takes teacher Bob Stroonz through a school year to the summer where, in the Berkshires, he teaches literature to rich kids abandoned by their busy, indifferent parents. Things don't go well.